Humble Howard Glassman is not only the morning radio personality I awoke to throughout high school and university, but he's also a very decent chap. 392 comments on this entry confirm I wasn't the only one enjoying his sense of humour and folksy charm with Fred Patterson on The Humble & Fred Show. Since writing that entry, I've set him up with a blog of his own and crashed at his palatial Oakville estate. Today, he took me flying. 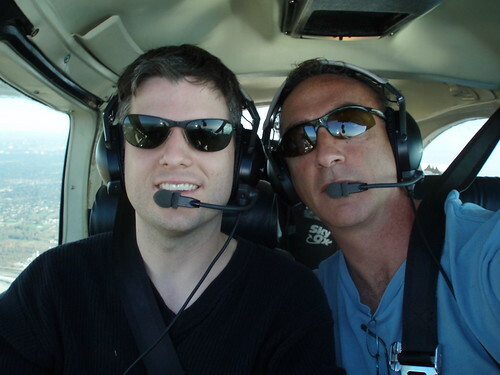 That's right, comedian Humble Howard is a fully licensed pilot who owns his own airplane. He picked me up bright and early this morning and took me to Buttonville Airport where we flew by the CN Tower and around Niagara Falls on an amazingly clear day. I say "we" because he frequently gave me control of the wheel, giving me a taste of how it feels to fly. There was a limited scope as to what I could do, but there was no doubt I was ascending, descending and turning the plane with a couple of fingers on my left hand. Awesome. When I wasn't controlling the aircraft, I was snapping pictures and absorbing all that goes into a flight like this. Howard frequently checks in with various flight services from Buttonville to Toronto and St. Catherines. There's a cool lingo to their chatter that makes you feel like they're part of an exclusive club you didn't even know existed. I learned Howard's plane is a 1974 model, but the engine is quite new. I also learned that I lucked out with the weather today because the entire flight was smooth as silk. Apparently skies this sweet are few and far between. It was one hell of an experience and now I just want to do it again. In the meantime, I've got 46 pictures in a photoset for you to check out. Thanks Howard!